Solo w/ Tom Johnston, Chad Kroeger, Lukas Nelson, Joe Satriani, Rick Springfield, Nancy Wilson, Michael Anthony, Jason Bonham, Vic Johnson. As usual, all proceeds will be donated to UCSF Benioff Children’s Hospital for pediatric cancer research. 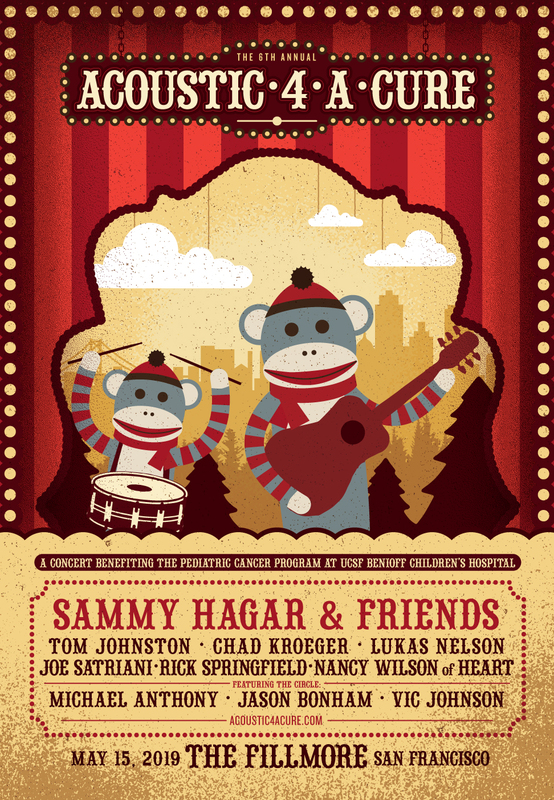 This year's lineup features Tom Johnston (The Doobie Brothers), Chad Kroeger (Nickelback), Lukas Nelson, Joe Satriani, Rick Springfield, Nancy Wilson (Heart), and The Circle. Tickets will go on sale Friday, March 22 at 10AM PDT at https://concerts1.livenation.com/event/1C005667C67C5D17. There is a 4-ticket limit per customer. Every ticket purchased will include one (1) CD copy of Sammy Hagar & The Circle’s new album Space Between. Customers who redeem the CD will also receive a digital copy of Space Between. Ticket purchasers will receive instructions on how to redeem their copy that will be mailed to them on May 10th. Will there be a VIP ticket level, this year?...or GA, only? Admin, Is this show on May 15th as usual?